In her performance Klangflug (2006 – 2013, several versions) Lara Stanic looks for ways to transmit the airiness and volatility of sound itself to the heavy loudspeakers, needed to produce sounds. By simulating sounds of an airplane taking off on her flute, she sets the loudspeakers free and they start to travel through the air. The result are flying loudspeakers. During the performance, the pitch shifters prolong Lara’s glissandi on the flute more and more, enlarging the possible glissando range of the flute. Lara explained to me that achieving the right the balance of sugar pile weight, big enough helium balloons, and the right pitches on the flute is a very delicate matter. 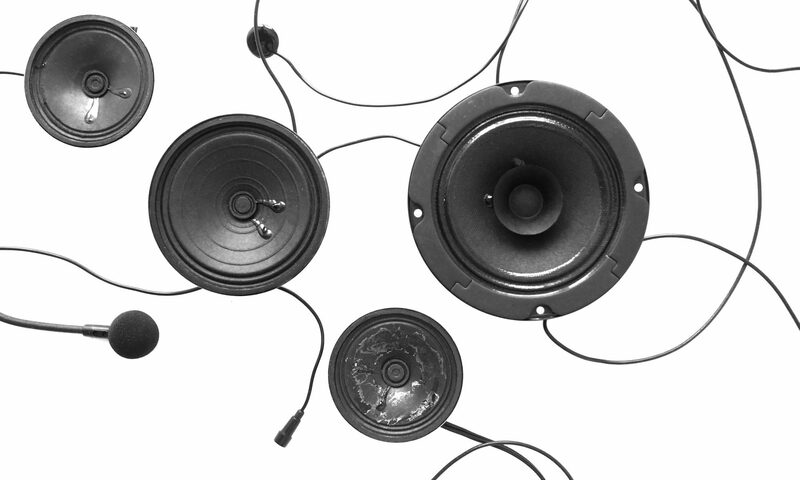 The amount of time it takes to free each loudspeaker is variable for each performance, and the height of their flight depends on how much sugar is left on the loudspeaker. 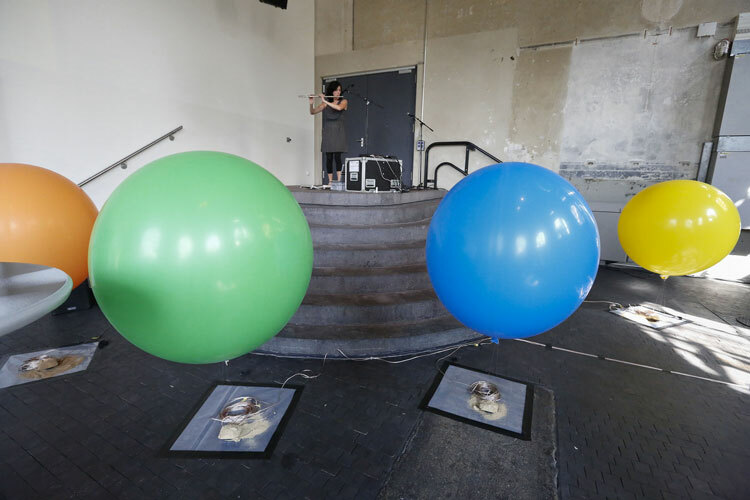 When I attended this performance, it was exactly this unpredictability that was so fascinating: the big balloons and the rising pitches built up the tension, whereas the final taking off of a loudspeaker always came as a surprise. The movement of the loudspeakers is only visually perceivable in the movie documenting the performance. Evidently, when hearing this performance live, an important aspect is also the upwards movement of the sound. And if you are curious as to why sugar is used: I asked Lara and she told me it was just the result of trial and error with different kinds of sand, sugar, and other material. Lara has created many works for microphones and loudspeakers. Another example is Open Air Bach. Other artists have focused not so much on the taking off, but especially on the flight itself of the loudspeakers. Works by Lucio Capece, Fabrice Moinet and Genoel Lilienstern are interesting examples (and I will write about these works in the future). An update: I wrote on Genoel Lilienstern’s flying loudspeakers.